I may have given this book three stars if not for the egregious editing errors that peppered nearly every page of the book (a few are detailed below). 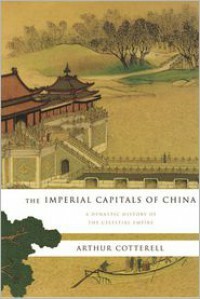 To the good: This book isn't really about the imperial capitals of China though often as not they do make an appearance in each chapter. Rather, I get the impression the author wanted to write an idiosyncratic little book where he could indulge himself in talking about China. And I didn't mind that. Cotterell has an engaging style of writing, and though he wanders around describing Chang'an in one paragraph and then jumping into the career of the poet-scholar-official Bai Juyi the next, it's all rather interesting (at least to a committed sinophile such as myself). If you want a more focused discussion of various periods, he has a brief little reference section at the back of the book. Unfortunately, I can only imagine that Cotterell and the editors at The Overlook Press (an apt company name if ever there was one) only glanced at the galleys before allowing this volume to go to press. 1. Sentence fragments. I was in a position to note one down immediately: p. 287, "Pu Yi's attempted restoration in 1917, which lasted for only a few days, he continued to live in the imperial palace at Beijing until 1924." There are at least 2 more that come to mind but I wasn't in a position to note them at the time. Trust me -- there're there. 2. A highly idiosyncratic use of the definite article. Or nonuse. There are points where Cotterell sounds like his first language doesn't have a definite article and he is unfamiliar with its use. 11. Names change (sometime within the same paragraph! ): "Bang Zhao" (correct) becomes "Ban Zhao"; "Dezong" is sometimes written "De Zong"; "Xiaowen" (correct) becomes "Xianwen"; and "Guo Xi" (correct) becomes "Gao Xi." 12. Inconsistent transliteration: "Wu Cheng'en" in some instances; "Wu Chengen" in others. 13. And on p. 249, the header is simply "CHAPTER TITLE" rather than the actual chapter title.